We've studied antique designs to recreate the technology of creating handmade Irish Crochet Lace (ICR) and have created a unique clothing collection for you! Irish Crochet Lace is entirely handmade of natural materials, it's created with a very fine crochet hook and is assembled manually with the needle on a dummy, seamless, to fit your figure perfectly!  We've chosen Celtic Triskelion (or triskel, from the Greek τρισκελης, "three-legged") to be the symbol of Annora brand. It's an ancient sign that represents three running legs emerging from a single point symbolizing the "time running", connection of experience gained in the past with what we have in the present, and what will bear fruit in the future. Triskelion is surrounded by the triple spiral, the symbol of female power, forming Annora logo. Annora is an Irish feminine given name (meaning "honor and integrity"). Sterling Silver label with no hallmark is a symbol of our honest work in creating high class deluxe clothes. 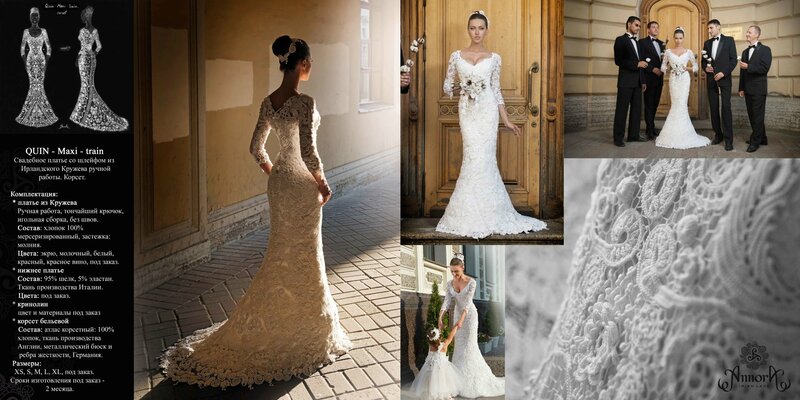 Cloth made of handmade lace are unique, exclusive, existing only in a single copy. There is a unique product number on the reverse side of each silver Annora label, so it's impossible to make two identical dresses. There are always small differences due to being handmade. Every piece made of Irish Crochet Lace is the one and only, like you cannot create two completely identical to the last stroke paintings! 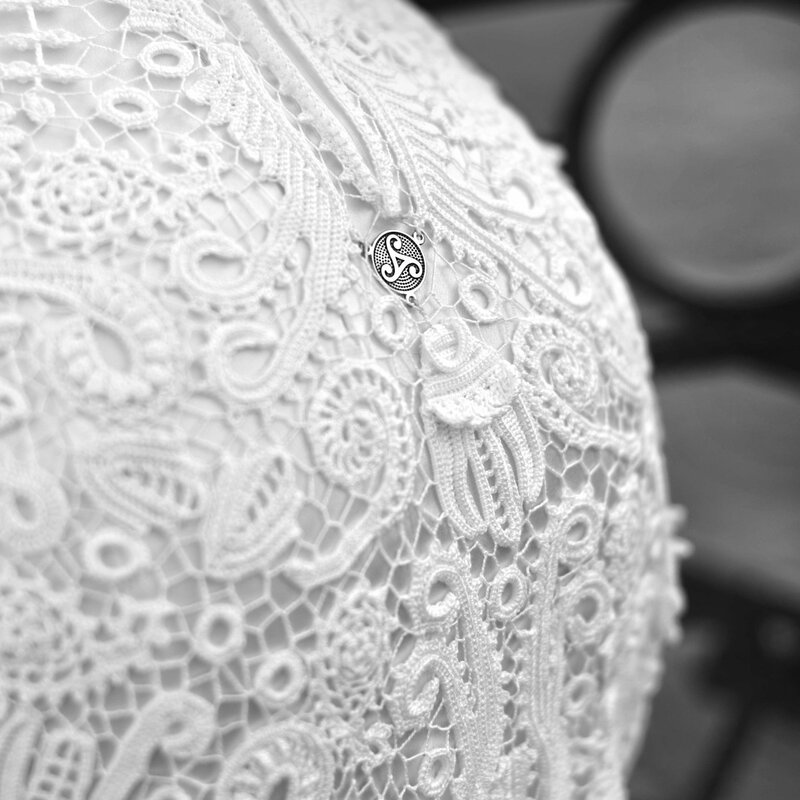 We brought our handmade Lace quality up to the highest level by dividing the process of creating pieces into the small stages, only highly specialized upscale professionals working at each of them. Every type of motif (flower, leaf, Paisley...) is made with very thin crochet by professionals, specializing in creating this specific motif, each artisan specializing in his own area. We crochet every motif to match our highest quality samples, thus unifying the style of our artisans. We fix motif threads carefully using frequent fixing ties assembling our products, that makes them very strong. Even if you tear a piece (it's a rare thing, usually is a result of contact with some metallic or sharp object), only the gap between connective mesh and a small piece of Lace occurs (it's easy to repair that within a few centimeters for anyone who can sew a button: our product package includes the thread and the scheme in case if you can't or don't want to bring the piece to our workshop). 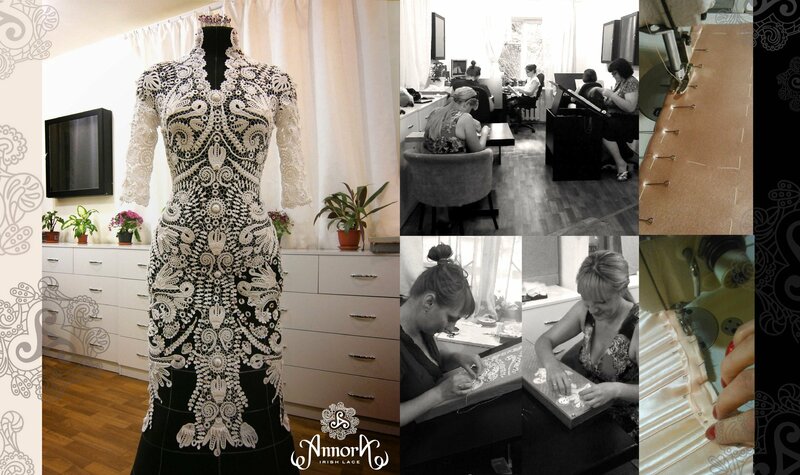 After that we wash and steam by hand all the motifs made to avoid the possible shrinkage when washing your dress! Then the motifs are pinned to the mannequin, and right there we assemble the piece by hand with a needle for a perfect seamless fit. This job is done by high class professionals in a particular type of assembling (by crochet or by needle). Our mannequins are based on large array of 3D scans of different sizes female shapes processing, so they not only meet existing standards but represent modern woman correctly. All the dark Annora Lace is created of light natural shades of yarn, and then is painted by hand with professional dyes. Hand painting is needed to lower the huge stress to the eyes of our artisans, because working with a dark thread requires several times greater concentration and time expenses in the production of one piece. The proven technology of hand-painting the lace gives cotton fiber extra protection, increases yarns durability and prevents coloring of the things that have direct contact with the Lace (underdress, top, underwear... or a man in a white shirt). Don't worry if you put on some weight and add up to 1-1.5 sizes: the Lace can stretch and take the form of your body. When you're back to your original weight, just wash your dress in hot water (over about 60 degrees), press it out with bath towel and dry straightened: chain stitches (connections) will shrink to their original form like springs, so the dress will fit you perfectly again! We use top quality 100% mercerized cotton tight twisted yarn to create our products. Pieces made of that yarn are durable, hygroscopic, easy to wash and are suitable for children and people with sensitive skin. Our underdresses are made of 95% silk with addition of 5% elastane, using specially created patterns, allowing the underdress to become "the second silk skin". You can purchase 1-2-3 underdresses of different colors (for example: beige, red and black) to wear with one dress, and create various looks combining it with different accessories (shoes-handbag-clutch-jewelry-makeup). You can wear your Lace dress on top of beige underwear for a special occasion, so your loved one would appreciate your elegance and would lose ability to think about anything but you! Annora wedding dresses not only took handmade lace from the Victorian era, but also a lingerie corset. 19th century women wore lingerie corset under any garment starting with the age of 4. Corsets are tailored "under the bust" and constructed manually with unique patterns of English corset fabrics (satin cotton with no synthetics) and solid metal German fittings (steel busk and stiffening ribs). Minimum corset tightening (for size 42: 4-5 cm) allows you to radically change female silhouette, making it extremely attractive, forming a thin waistline and outlining thighs. You can wear that corset all day without feeling discomfort when eating or moving around. You can wear our corset with any knitted dresses at your wardrobe. We also make evening gowns to wear on top of the corset, giving your body seductive shapes, to make you look stunning during official business activities, at the red carpet or giving public speech. 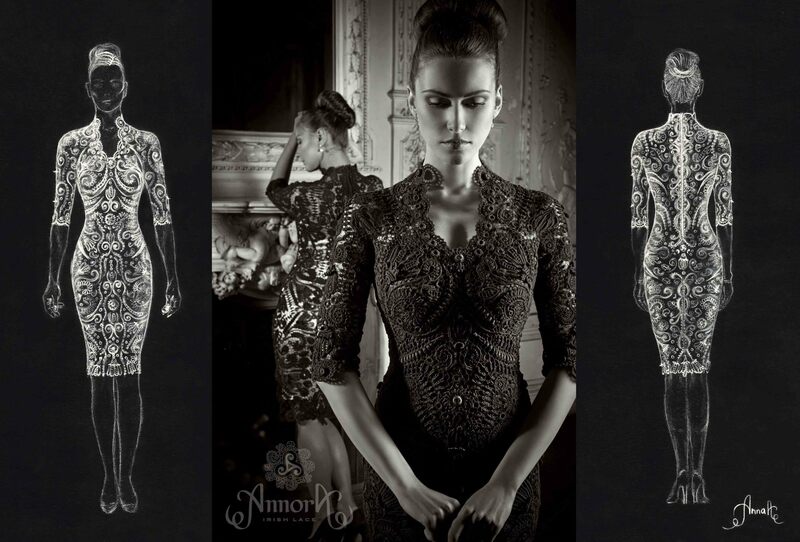 Creating Annora dresses our designer uses visual perception effects and illusions patterns in clothing: cloths made precisely by hand work as Photoshop! You will be surprised how fantastic your figure will look. Just pick a neckline, the length of the dress and sleeves, and a color that you like and that suits you! All of our Lace patterns are original, created by our designer and have reservation time for filing for copyright, as you can patent a specific lace pattern but not a modifiable motif schema. In 19 century it took a YEAR of daily 8 hours work to create one "made to order" ICL long wedding dresses by one artisan. Each artisan usually specialized in several, but not all phases of dress creation: huge work costs, long waiting period for a customer and unexpected result with no opportunity to correct errors are things of the past! 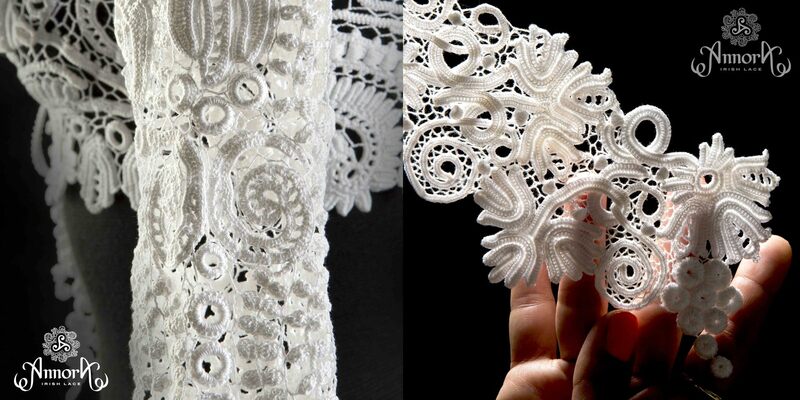 The time it takes to create a handmade Lace is the same in the 21 century. One artisan used to create one dress, but we have dozens of artisans in our ateliers to help us create high quality pieces very quickly! That's why the price of handmade Lace at all times has been and will be high, and a dress like this will always be a diamond of your wardrobe. You can pass your Annora dress to the next generation as a family value!